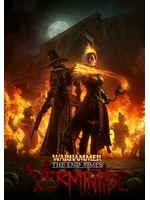 THQ Nordic has released a new trailer for Fatshark's coop shooter Warhammer: End Times - Vermintide as the game will hit consoles next week. In the meantime you can try the game with all characters and three maps since the open beta is now live on Xbox One and PlayStation 4. Update: the beta is actually only on Xbox One at the moment. This and the new space hulk i want.